2019 Rates: Please see our reservations page for special weekday and weekend rates. ABOUT US: Cape House is a beautiful and romantic Cape Cod style home situated directly on the wine route in Old Town Niagara-on-the-Lake, near the Shaw Festival, spas, cycle paths, golf courses, shops, restaurants and a short walk to spectacular sunsets over Lake Ontario. A creative and seasonal hot breakfast is served daily in the French Country inspired dining room. Our philosophy is to use the very best local ingredients wherever possible and to use them to prepare interesting and delicious breakfasts. Breakfast is served promptly at 9:00 and is a plated and served breakfast (Chef’s choice and not a buffet). Guests may wish to socialize with other guests in our guest living room before breakfast, or in fine weather outside. Fresh fruit or a smoothie will be offered each day. The Chef's Choise hot course may be our own breakfast soufle or French toast with homemade fruit sauces and local maple syrup or Eggs Benedict. Each meal is accompanied by homemade croissants, corn muffins or biscuits and, often, homemade sausage, crisp bacon or ham. With advance notice we are happy to offer options for those with dietary restrictions including vegetarian options. After a full day of cycling, wine tasting, visiting Niagara Falls or shopping our guests may top off their day by relaxing in our upper lounge or, in fine weather, on the front porch, the verandah or our brand new pergola covered deck in the garden. Cape House is decorated to enhance the guest experience. Common areas are decorated in the style of French Country with soothing pastels and comfortable furnishings. Art by renowned local artist, Lois Stevens, adorns these common areas. Each guest room has its own ensuite bathroom with soft, luxurious towels. Toiletry dispensers have been incorporated for ease of use and to protect the environment and each bathroom comes with a hair dryer. Each room has its own distinctive upscale dAMPEReacuteSEMIKcor. Amenities include duvets and both soft and medium-firm pillows, luxurious pillow-top mattresses, Each room has its own sitting area where guests may relax in privacy. Rooms also include wireless high speed internet access and a flat screen TV. Cape House has central air conditioning. 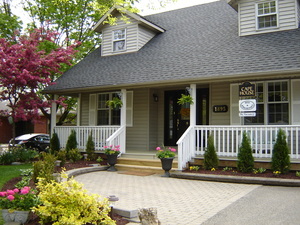 We are an adult oriented B& B (no children under 18), a non-smoking and pet free property.